THE FRONTIER MARKET EXPRESS IS LEAVING, WILL YOU BE ON IT? We invest in exotic markets, mostly in Africa, the Middle East and Asia. More specifically, we specialise in places such as Nigeria, Pakistan, Egypt, Kenya, and Morocco because we live and work in these markets. This also means that we like to think we have a fairly nuanced perspective of what is actually going on there. And even though things aren’t always easy, it is hard to ignore that there is real intrinsic growth and an abundance of opportunities as every year millions of people join the global consumer pool (Here’s a recent article with more perspective on that). What is clear is that these markets are under-researched, ignored and even fundamentally misunderstood by investors. This also means that every now and then these places offer very attractive entry points for the intrepid investor. First of all, despite the fact that frontier markets, and especially Africa are generally seen as dangerously volatile markets, when you actually look at the facts, it may come as a surprise that over the past 15 years, they actually managed to perform very much in line with developed markets, even a tad better in Africa’s case. Secondly, when we speak to investors, we realise that many of them hold on to the belief that frontier markets are essentially a ‘derivative’ of the developed markets, meaning that, if risk is ‘on’, you buy it and you get out of them when risk is ‘off’. Finally, if the 15-year annualised average return of markets is somewhere between 7-10%, and considering the fact that frontier markets can do very well even when developed markets struggle, what are the chances that frontier markets will catch up and revert to the mean? We think it’s worth taking a bet on. The risk-reward opportunity seems compelling, especially in the case of Africa, where merely returning to the 7-10% range would imply a big move up from 2.4%. For even more perspective, if we look at the relative valuation between the emerging markets and the frontier markets, what we see is more evidence that frontier markets have been relatively undervalued for some time now. So yes, in this dance emerging markets clearly takes the lead. In our view, most of the compelling investment are currently to be found in Africa, so if anything will drive a sustained frontier markets recovery, it should be Africa. The chart above looks quite complex at first sight, but it is a fairly simple relative valuation between Africa and Emerging markets over a 700 day rolling period. 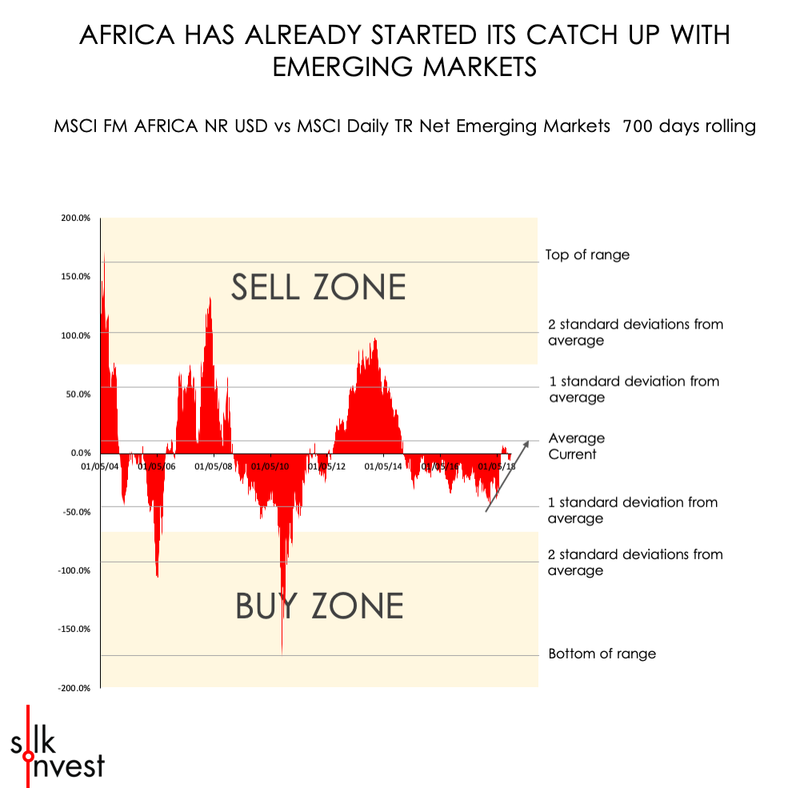 So, in conclusion, the swing towards Africa outperforming Emerging markets is already in motion and it is being backed by long-term investors.